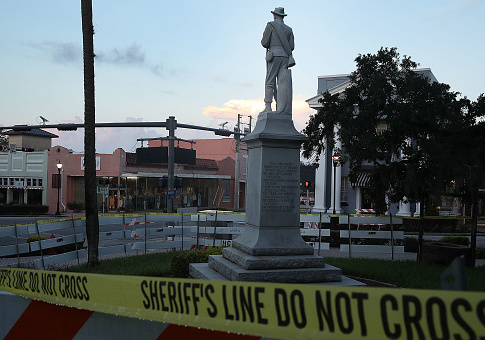 The removal of Confederate monuments from their municipalities is costing taxpayers hundreds of thousands of dollars in U.S. cities. The decision by several U.S. cities to start removing Confederate monuments and statues was spurred after a group of protesters made up of "Alt-right" activists and white supremacists demonstrated in Charlottesville, Va. against the decision to remove a Gen. Robert E. Lee statue and rename the park, "Emancipation Park." The demonstrations turned violent, ultimately resulting in the death of a woman after a man rammed his car into a crowd of counter-protesters. The suspect, James Fields, has ties to extreme, Alt-right views. While municipalities across the county have decided to remove images of the confederacy, the actions have had unexpected costs. City officials in San Antonio, Texas learned in a memo on Monday that it cost the taxpayers $258,680 to remove its lone Confederate monument from Travis Park last month, according to Fox News. The memo, obtained by Fox San Antonio, showed it cost $147,775 for a third-party company to remove and transport the monument, $103,809 for police staffing, including officer overtime, fencing, barricades, and surveillance cameras. There was an additional charge of about $7,000 to cover replanting costs. City officials told the television station that city council members originally approved $150,000 for the company to remove the statue, and that police staffing was already part of the department's annual budget. Some city council members, however, felt they were misled by the final total of removal costs. Councilman Greg Brockhouse specifically had concerns about the additional costs. "Being told directly to my face by a city director that this was $150,000 and no more, then to see this — I think that deserves further research," Brockhouse said. Brockhouse voiced in an interview with local CBS affiliate KENS-TV that it made "absolutely no sense" for costs to go over the original amount, and the city had already incurred $17 million in police officer overtime. Taxpayers in Dallas, Texas were also hit hard by the removal of a statue of Lee last month, costing taxpayers around $450,000. In addition to that statue, the city has considered removing another another Confederate monument and potentially changing street names, according to CBS 11. The Dallas Confederate Task Force Committee recommended last month at its final meeting the removal of the Confederate monument at Pioneer Park in downtown Dallas next to the convention center. The monument in park cemetery was built in 1896, and has a Confederate soldier atop a six-story tower surrounded by four Confederate leaders. Moving it will cost an estimated $800,000, FOX 4 News reported. The removal of the Lee monument incurred an additional cost, after a crane hired to remove the statue collided with a semitrailer near downtown Dallas, killing the semitrailer's driver and badly damaging the crane. President Donald Trump has been an outspoken critic of removing the Confederate statues, saying that it is "sad to see the history and culture of our great country being ripped apart with the removal of our beautiful statues and monuments." This entry was posted in Culture, Issues and tagged Charlottesville, Racism. Bookmark the permalink.